Do you like Bloom vs Raven Popularity Contest? Share it with your friends. 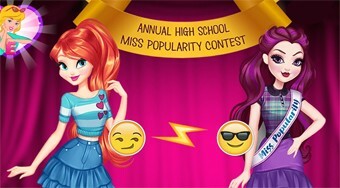 Bloom vs Raven Popularity Contest is a wonderful girl game from the Ever After High School, where the next year of the Queen of Fame contest is held. The final was made by two girls Bloom and Raven. Your task is to choose for both girls a trendy hairstyle, clothes, fashion accessories and find out which ones will become this year's winner.